OSWEGO, NY – MC King was inducted as a new member of Oswego Rotary by President Sue Witmer. 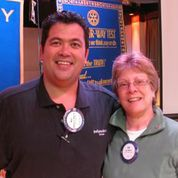 MC King, Oswego Rotary member and President Sue Witmer. King is the plant manager at Oswego’s Dynegy Power Generation plant. Since relocating to the Oswego area King is involved with the Salvation Army and United Way boards. King presented a classification talk on energy, the recent surge in residential energy bills and the economics surrounding power generation.